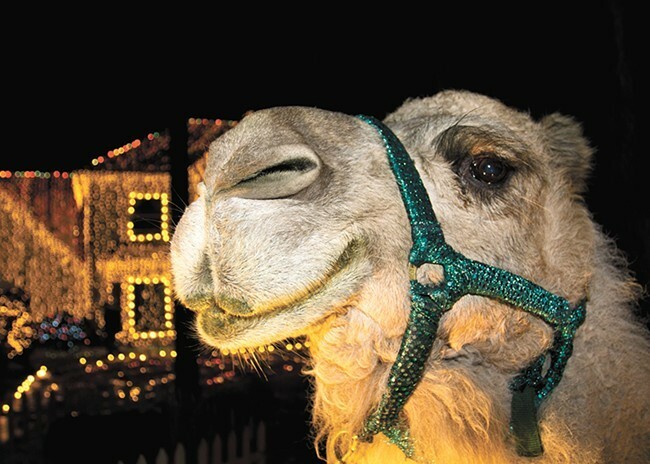 Among many other problems, Dolly the Camel broke the HOA's prohibition about keeping livestock on their property. For Jeremy Morris, the court decision last October meant it had all been worth it. There had been nearly four years of neighborhood fights and legal battles and Fox News stories over his five-day 200,000-light Christmas extravaganza. The Idaho jury had unanimously concluded that the West Hayden Estates Homeowners Association had discriminated against the Morris family, in part because of his religion, both before and after they purchased their home. It ruled that the HOA intimidated, threatened or interfered with Morris' home purchase, and expressed a preference for a nonreligious individual. On top of all that, the jury had awarded Morris $75,000. The day the verdict came out, Morris told the Inlander, he went to the cross he'd built in his front lawn — one the homeowners association never objected to — and turned on exterior spotlights to illuminate the cross, symbolic of God's promise. "I've been lighting it up ever since," Morris says. "It was kind of my plan all along. To leave the cross here and illuminate the cross when my family has been vindicated." The day of the verdict, Morris recalled sitting on the chair in his office and watching a YouTube video — the one where he'd edited a picture of him and his friends into the final scene of It's A Wonderful Life — and crying. "Through all the strife that my family endured, in the end I know that God's name was lifted up," Morris said. "And now there's a federal court precedent that will protect other Christians." Except it wasn't quite over. The homeowners association had asked the federal judge to play a rare card that almost never comes into play: Overrule the jury. And last week, Idaho District Court Judge B. Lynn Winmill, an appointee of Bill Clinton, did just that. Winmill completely reversed the case, concluding that religious discrimination hadn't occurred. On top of that, he awarded the homeowners association a big win in their countersuit, concluding his Christmas event had broken neighborhood rules, banning Morris from holding such a huge Christmas event in the neighborhood in the future, and ordering he pay the HOA attorney fees. "I look forward to appealing to the Ninth Circuit," Morris wrote to the Inlander in a text message. "The judge acknowledged he has never (or almost never) substituted his opinion for that of a jury in 31 years. The unanimous opinion of seven jurors must be given great weight in a country that values the principles undergirding a right to trial by jury." Yet even if the Ninth Circuit objects to Winmill's ultimate ruling, he's also outlined what you could consider as backup rulings. If the Ninth Circuit doesn't agree with his judgment reversing the jury's decision, Winmill writes, the homeowners association should be granted a new trial. And if the court doesn't agree that the homeowners association should be granted a new trial, those damages should be reduced from $75,000 to the not-quite-as-dramatic total of $4. Morris' biggest piece of evidence to show religious discrimination was a letter he'd been sent in January of 2015, outlining the HOA board's objection to his planned Christmas event. standing rules and regulations and fill our neighborhood with the hundreds of people and possible undesirables. The first draft, which Morris found later during discovery, was even harsher. It referred to residents who "are avowed atheists" and warned that Morris' event would fill the neighborhood "with the riff-raff you seemed to attract over by Walmart." "We don't allow 'those kind' in our neighborhood," the letter concluded. Winmill had initially concluded that the letter was enough evidence of discrimination that the case could proceed. But last week, he concluded he'd screwed up. While the first draft was "boorish," the judge concluded it couldn't be used to prove discrimination. "Far from being intolerant, the January 2015 letter’s religious reference was an attempt to respect religious pluralism," Winmill wrote. "Furthermore, the January 2015 letter’s use of the term 'undesirables' is an attempt to raise the safety concerns associated with bringing a large number of unknown individuals to a normally quiet and calm area." Winmill pointed out that the first draft hadn't actually been written by a board member and that the board hadn't actually even approved signing off on the final draft. Not only that, he argued, but the fact that the original letter had been toned down by the board showed that the draft had little bearing on the board's intent. Winmill also pointed out that most of the board members were Christians themselves — the board president at the time was actually married to a Christian minister. True, Winmill acknowledged, Christians can discriminate against other Christians for being Christians in some cases. But the probability is low, the judge argued. Besides, even though the HOA warned Morris about its objection, Winmill points out, Morris "nevertheless hosted the Christmas Program in both 2015 and 2016." Thus, he continues, it's hard to show the Homeowners Association interfered with Morris' rights "in any meaningful way." Jeremy Morris' own secret recordings and social media posts led the federal judge to believe he was "confrontational" and untrustworthy. Morris went into the case with a secret weapon: He'd quietly recorded conversations with his neighbors. But the recordings also showed Morris repeatedly yelling at his neighbors and threatening to sue them. In one recording he even threatens to use the neighborhood code to come after his neighbor's dogs. "The recordings Mr. Morris created of his interactions with other homeowners in the West Hayden Estates show that he was aggressively confrontational with those homeowners and routinely threatened them with litigation," Winmill wrote. He pointed to Morris' own Facebook posts to show that the "testimony was riddled with inconsistencies." "Mr. Morris’ testimony was frequently contradicted by extrinsic evidence that he himself created," Winmill wrote. By contrast, he found Jennifer Scott, the former president of the homeowners' association, credible. The judge appeared to be sympathetic with what Scott went through, describing how Morris would frequently call her and engage in long, winding telephone conversations. "During those calls, Mr. Morris was aggressively confrontational with Ms. Scott, who eventually asked him to stop calling her," Winmill wrote. "Eventually, Ms. Scott’s interactions with Mr. Morris drove her to resign her presidency." To the judge, the homeowners association's witnesses were credible. Morris and his witnesses weren't. During the Inlander's interview with Morris last year, Morris pointed to a crucial moment during the trial. Four female witnesses had testified to being yelled at or harassed by some of his neighbors during the two years he'd put on his big Christmas show. "That was big," Morris says. "I saw some of the jurors in the front row, they obviously [thought] that was, you know, terrible." Yet Winmill had specifically barred the jury from taking into consideration the testimony about "interactions with an individual shouting at them on the street, because it was not established that such an individual was a member of the board or an agent or employee of the HOA." Winmill had concluded that the case law suggested that the HOA board couldn't be legally responsible for the actions of a homeowner who wasn't a board member or acting on their behalf. That's why Winmill banned Morris from testifying to a threatening exchange from a neighbor named Larry Bird (who, to be clear, was never a power forward with the Boston Celtics). After Three Percenters, a right-wing group, had shown up uninvited on Morris' doorstep in 2015, offering their armed security services, Bird had angrily confronted Morris, threatening to "take care of him." "Mr. Bird’s statements, as recorded, cannot be reasonably interpreted as a credible 'death threat,'" Winmill writes. Yet throughout the trial, the alleged death threats were mentioned multiple times. "It is exceedingly unlikely that the jury was actually able to set aside the testimony of nine witnesses regarding threats they received from third parties," Winmill writes. 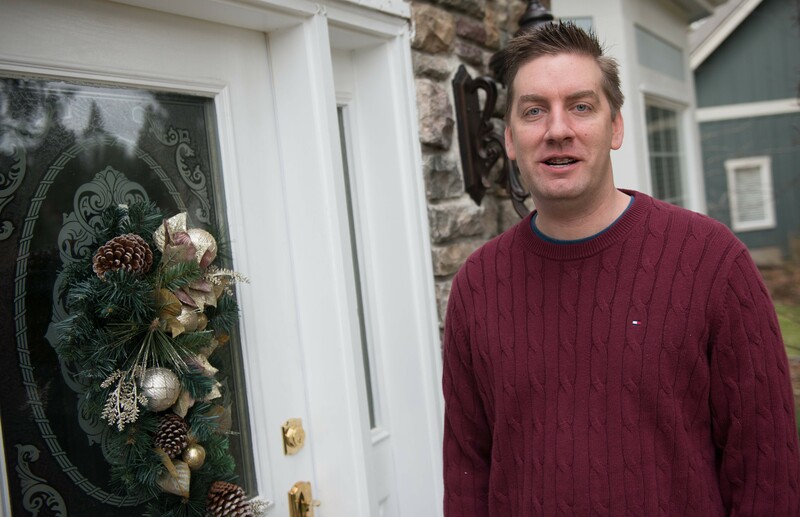 Even before Morris moved into West Hayden Estates, he and the homeowners association were locked in an argument over whether his Christmas spectacular would violate the lengthy list of neighborhood rules. Morris repeatedly scoffed at the arguments of the homeowners association, arguing their complaints about his event were just paper-thin justifications for religious discrimination. Anyone who said they had a genuine problem with the impact of his event? But Winmill goes down the neighborhood covenant point by point, concluding that Morris' event didn't just violate one or two rules, but a whole bushel-full. The camel and donkey from the Nativity scene, for example, violated the neighborhood rule against keeping livestock on his property. The big sign on Morris' front lawn violated the rule against exterior signs. Turning the home into the multi-day event venue for a Christmas program to raise money for charities violated the neighborhood's rule about using the homes "for any purpose other than a single-family residential purpose,” he ruled. Not only that, but the neighborhood rules ban decorating the exterior of a house without permission from the board. Yes, there may have been other Christmas decorations on other houses throughout the holidays. But Winmill ruled that these decorations were different in both type and scale — and noted that the homeowners association failing to enforce the rules over minor decorations didn't mean they couldn't enforce the rules over major decorations. And then there was the broad rule simply prohibiting "any activity which would in any way interfere with the quiet enjoyment" of other homeowners. Winmill rattles off a whole succession of reasons that rule was violated, including noise from external speakers, buses and cars blocking traffic, and thousands of visitors who created "excessive congestion in the neighborhood and temporarily changed, indeed destroyed, the quiet, suburban nature and appearance of the subdivision." And considering that the congestion had the chance of impeding ambulances, Winmill concluded that the Christmas event violated the rule that bars anything that "might be unsafe or hazardous to any person or property." If you're going to use this reversal to argue the Idaho jurors were a bunch of idiots, Winmill has a message to you as well: don't. "The jury in this case cannot and should not be criticized," Winmill says. "Throughout the trial they were engaged and submitted questions indicating that they were each, in good faith, attempting to discharge their duty as the finders of fact. Nevertheless, they issued a legally unsupportable verdict."